Are you looking for, Municipal Service Commision Deputy Manager & Sub-Overseer Exams Syllabus papers? Then here is the best place for you. You can download all the exams syllabus like ssc, bank, upsc, wbssc, msc, wbcs, rail, clerk, group d etc from our website. Today GK Solve share an important Exams syllabus for you.Most of the students Waiting for the West Bengal MSC exams. So they need to know Syllabus. For better result in the examination, first, of you need to know particular examination syllabus. then practice daily syllabus wise. 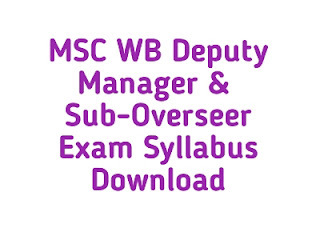 So, here GK Solve share, MSC West Bengal Deputy Manager & Sub-Overseer Exams Syllabus pdf file for you. This is the most important for you. So candidates are requested to download as soon as possible and start practice daily.